A great historical fiction book! It caught my full attention at once. It’s a great classic and very memorable. This heartwarming story is about a World War Two evacuee called Carrie, and her brother, Nick, who were evacuated to a Welsh town. They find themselves living above a grocer’s shop. Mr Evans, who wanted two girl evacuees, is an ogre-like bully. On the other hand, his sister, Auntie Lou, is loving and and eager to help the siblings in any way she can. 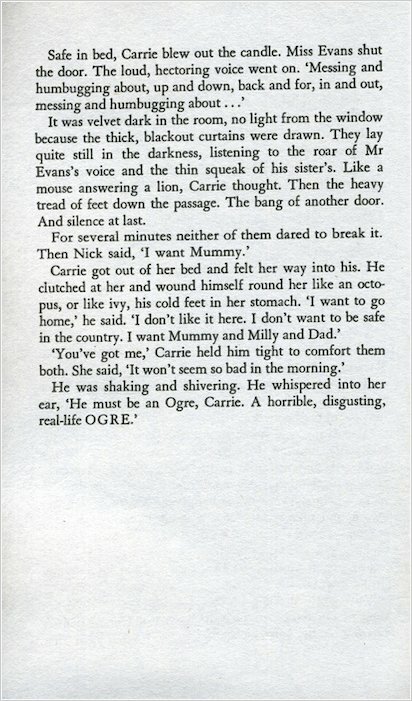 This book is written by Nina Bawden, in 1973. 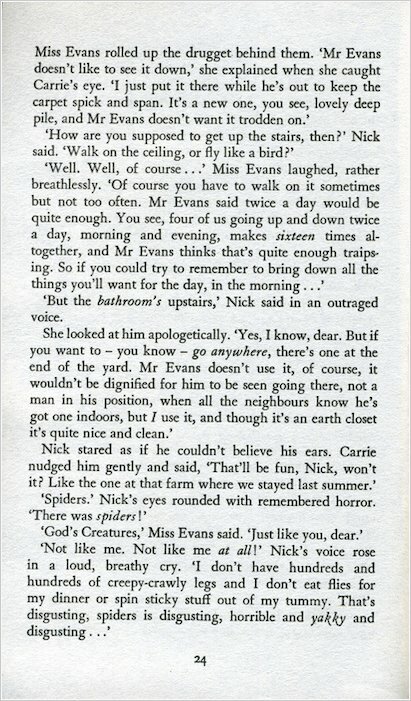 In Mr. Evans’s house, all things plain are regard to with respect (even walking on the stairway carpet more than twice a day is considered a luxury). However, when the children are sent to Druid’s Bottom to fetch the Christmas goose from Mr. Evans’s estranged sister, Mrs. Gotobed, they discover a new and welcoming world of warmth and plenty. The house is managed by Hepzibah Green, a kindly, self-professed witch, assisted by the tongue-tied Mister Johnny, a simple-minded cousin of Mrs. Gotobed’s. Also living on the premises is Albert Sandwich, a fellow evacuee who Carrie befriended earlier. Druid’s Bottom provides a magical refuge to which the children return as often as possible. Hepzibah casts spells with stories, including the matter of the resident ancient skull and its curse. 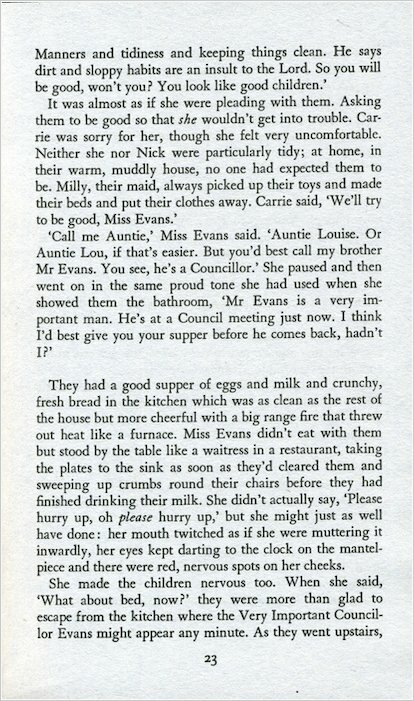 The dying Mrs. Gotobed, Mr Evans’ and Auntie Lou’s elder sister, gives Carrie a mysterious last message to deliver to Mr. Evans after her death. Carrie doesn’t quite grasp the meaning and, with the best of intentions, relays the message with dire consequences. Did Carrie bring down a curse on those she loved by doing the worst thing she ever did in her life? It is only when Carrie returns to Druid’s Bottom as an adult that she learns the fate of her friends. And it is only then that she is able to fully understand her experiences there as a young evacuee. This exciting novel is from the point of view of Carrie Willow; polite girl with green eyes, long dark hair and is fairly short. Being very protective over her brother, she always tries to keep him out of trouble. But, at one point, she feels betrayed, when she finds out Nick has been keeping secrets from her… Nick; funny, dark haired and navy eyed, cute, and very truthful. 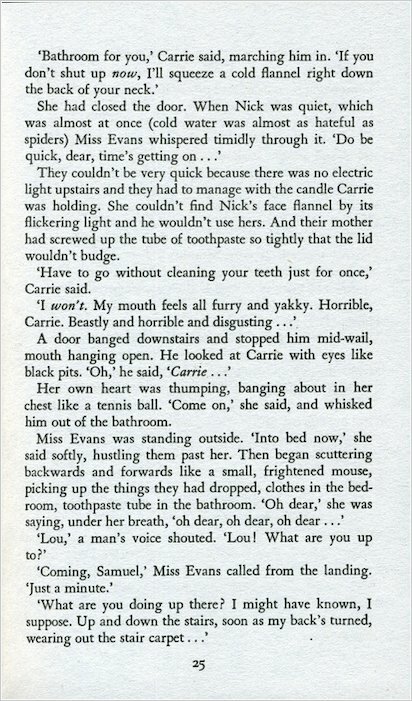 Hating Mr Evans, and hating Carrie when she sticks up to him, he is very friendly with Auntie Lou. In addition to that, (like Carrie) he is also very friendly with Albert Sandwich; a clever, geeky evacuee, Hepzibah; said to be a witch, but too kind and caring, Mr Johnny; a distant cousin of the Gotobed and very good with cows, Mrs Gotobed; elder sister of Mr Evan and Auntie Lou, is kind and good humourdly and leaves carrie a message for Mr Evans; nasty, mean and really bad tenmpered, he takes in Carrie and Willow and works in his shop: Samuel Isaac Evans Retail Grocer, Auntie Lou; kind, caring and scared of Mr Evan’s, she eventually escapes from him and gets married in America. The book itself is not bad; in text size or in amount of pictures. 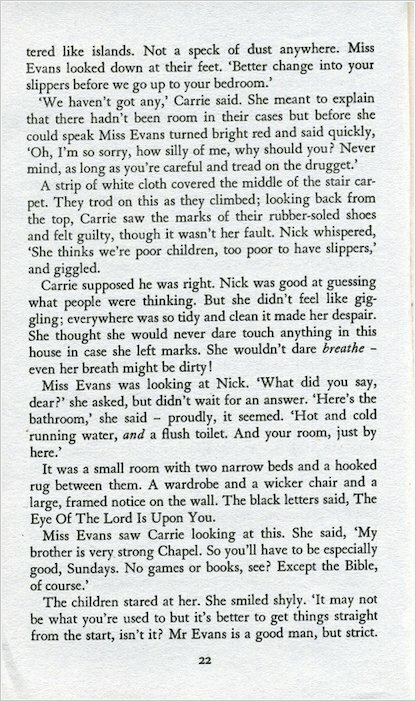 The text size is standard, and a picture is given before each chapter. This will allow us to imagine the picture more, and therefore a minimal (or none) amount of pictures would be ideal. This amazing book pulls you straight into it, even if you read it after a long time frame. We enjoyed this book very much, and has a fabulous storyline. It takes us back in time to offer more and more little pieces of information and in the end they all fit together to create a generally brilliant plot! We rate this book 9/10 as it provides everything a perfect book needs. This book was sad. It described the war and troubles people faced at that time well. I read it as part of a group in English. It was an exilent read for me. So good. I would recommend. Everything was fab. I have not read this book but some people have said it is good some people are saying it is bad. Once I’ve read it I will decide hopefully. I might not even finish it i’m reading so many other books I’m a total book worm!!!!!!!!!!!!!!!!!!!!!!!!!!!!!!!!!!!!!!!!!!!!!!!!!!!!!!!!!!!!!!!!!!!!!!!!!!!!!!! I’M IN THE WORLD OF BOOKS!!!!!!!!!!!! Carrie’s War is a good book. It is a bit spooky though. It is a very good portrayal of WWII. I would also recomenned other Nina Bawden’s. This book is great. Its a great story line and has a great ending. I would recommed this to the ages of 10-12 years. Carrie’s war is a emotional, funny, sad, happy, fantastically written book! It has so many things that you want a book to have. 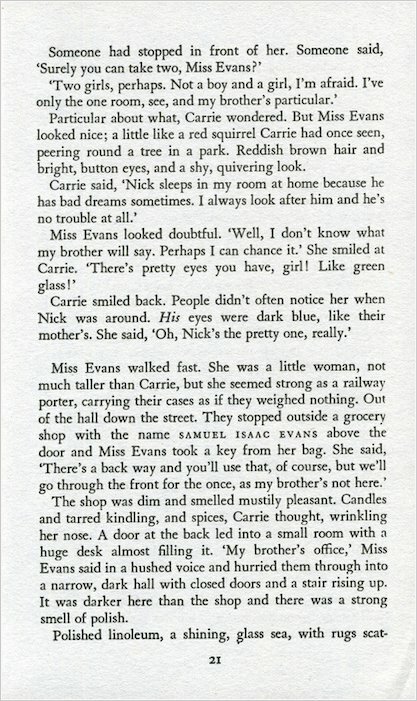 Although it is a bit old-fashioned, Carrie’s war is the perfect example of a book well written. I have read this and it was upsetting, not the best book. Recomendit for people who love world war 2. Carrie’s War is based on the dreadful time of WWII. Carrie is talking to her children about the time when she was evacuated to a Welsh village. . This is Nina Bawden’s best story – Keeping Henry is nowhere near as good! If I said that this book was not tremendous, I would be completely lying! I’d better stop here before I give away too much information! 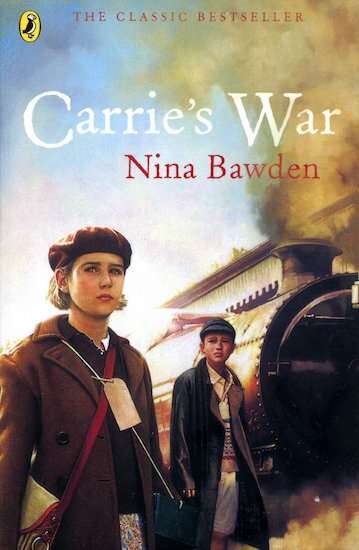 Carrie’s War written by Nina Bawden is a powerful novel that makes you feel like your in the story with Carrie.The book itself is about a girl Carrie and her brother Nick evacuated in typical war time Britain to wales to a remote village. The story is about how Carrie learns how to adapt to her evacuation parents and other things.It is a gripping novel and i would recommend it to everyone. this so cool. it is a good because we read the life of childern who have been evatated. It was dramatic when Carrie did the terrible thing. When she did it, I felt like crying.